Ever feel like making a t-shirt waterproof? Thanks to Rust-Oleum, now you can. They’ve developed NeverWet, a spray that makes almost anything completely waterproof, with the help of Ross Nanotechnology. We (and everyone else who has ever dreamed of a waterproof world) have been eagerly awaiting the product’s availability. After a lengthy development, NeverWet is finally in stores and usually costs around $20 per can. 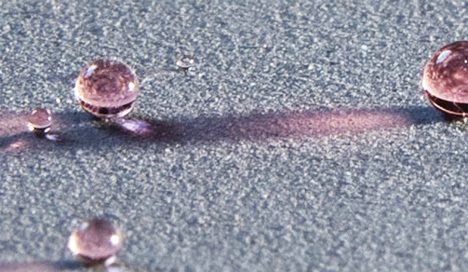 A silicone-based ultra-hydrophobic coating, the waterproofing system is a two-step process, with one can covering about 10-15 square feet. The demonstration videos are amazing and showcase the coating’s ultra-waterproofing abilities.